Today's post is a little catch up with what I've received in my last three editions of 'My Little Box'. 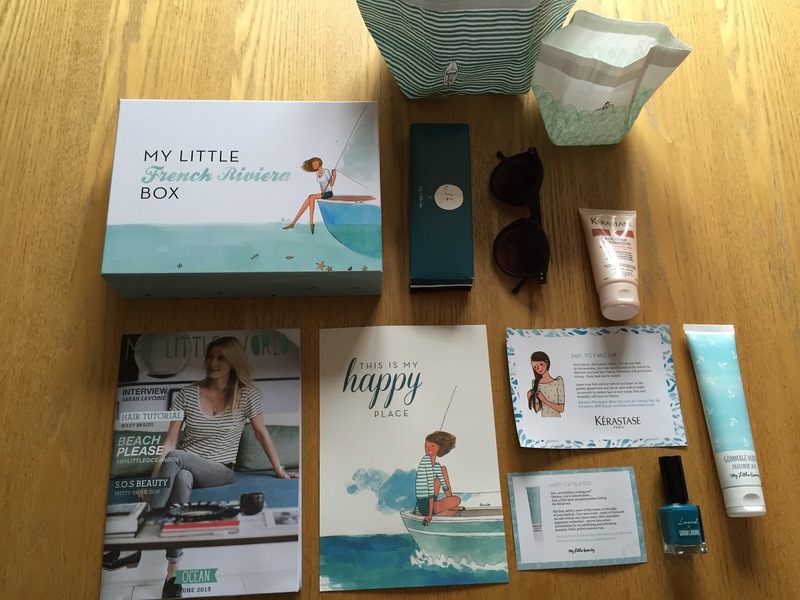 I'm sure that anyone who's anyone in the blogging world now will already know about 'My Little Box' and will have probably also received and posted about these very boxes that I'm going to discuss. Nevertheless I thought that they were worth sharing, particularly as all three have gotten me very excited about my forthcoming holiday...it's almost like they were made specifically for me!! Yes, literally days after my Mister and I booked our holiday to Cannes (20 days to go!! ), this little beauty arrived in the post...talk about fate! After being so excited about booking my holiday, this box couldn't have been timed better. This box was designed by up and coming interior designer Sarah Lavoine and she is responsible for the addition of the cool sunglasses and gorgeous nail polish that I can't wait to try out. I also received those cute little planters (which I think may be used for make-up and brushes instead!) and a gorgeous 'My Little Beauty' body scrub and Kerastase hair tamer for unruly hair. Perfect! Okay, so twenty days to go...I should be pretty organised by now for my holiday right? Er...we'll see! At least my documents will be order with my cool travel organiser, perfect for storing my passport and travel documents. The little bottle of micellar water will be travelling to Cannes with me, along with the sweet smelling after sun cream. I wasn't that keen on the gold tattoo transfers (I rarely say this but I believe I'm about 20 years too old for them and nowhere near cool enough to pull them off!) but I loved the shade of the Essie nail polish...summer in a bottle. The cute Kanako designed postcards are too pretty to use but I'm sure I'll find somewhere to put them. I promise to 'Never Stop Exploring' and can't wait to use my new goodies in Cannes...eek! You can subscribe to 'My Little Box' here. It's such good value for money, I'd really recommend it. You can also read about some previous boxes here and here, if you still need convincing! Gah I've never heard of My Little Box but these are just divine! The My Little Road Trip box is so beautiful, I can't even begin to describe how much I love it. I've just gone on the My Little Box website, and although I can't promise anything I can't help but swoon over how awesome everything looks!